I purchased this jar recently at the thrift shop for $6. It is about 10 1/2" tall, has a metal cover, and appears to be vintage. Angie at Knick of Time Interiors had recently posted about packing tape image transfer to glass, and I wanted to try the transfer method myself. First I made a label on Picmonkey. The tape I had on hand was about 2" wide, so I centered my words like so. After I printed the label on my inkjet printer, I copied it on our photocopier at work. You can also use a laser printer. There is no need to reverse the image with this transfer method. Just place the tape over your label, and burnish the tape to the paper with something like a Popsicle stick. I used the wooden handle of a paint brush. I wet the paper backing of my tape transfer and simply rolled the paper off with my fingers. It didn't take too long, and you can feel and see if the paper backing is still on your tape. When I had removed all of the paper, I dried the sticky side of the tape with a hair dryer. It didn't take more than a couple of minutes to dry. Then I applied my tape cling label to the front of my jar of zinc jar lids! 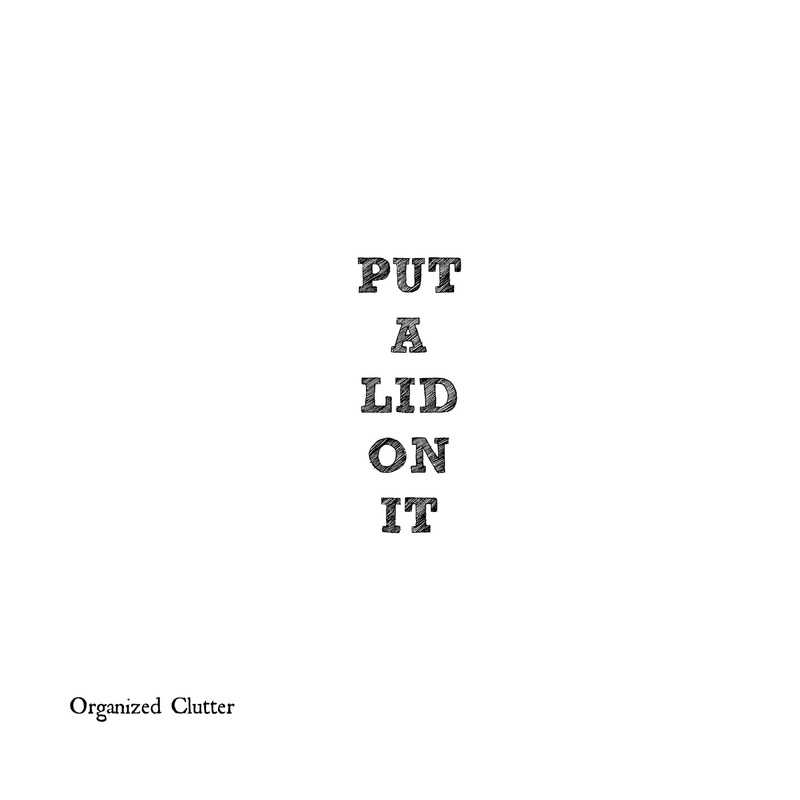 Hence the "Put a Lid on It" label. My attempt at a pun. Anyway, I like displaying vintage utilitarian items as interesting decor in my farmhouse style kitchen, and this works for me. And, when I am tired of this display, I can remove the both cling and the lids and start all over! Amazing.....I love this! Thanks for sharing. Another great idea! I didn't know you could use tape as a transfer, I'm a klutz with it. Thanks for the idea. I'm clearing out lots of stuff I know I will never have time to deal with, but I'm still trying to finish a few things. Great job! And so cute with the lids in there! I love it, Carlene, and I'm glad my tutorial helped you do it!! 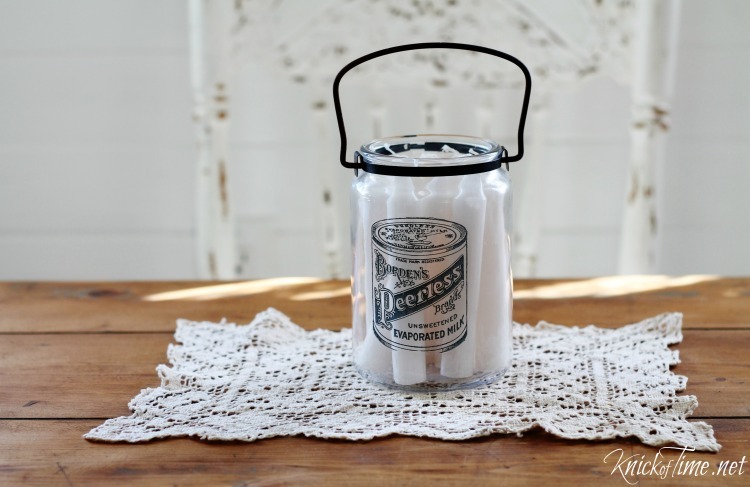 I have a stack of old canning lids too, and need to find a cute way to display them. Hi, Carlene...this is as cute as can be...you did a great job on it. Love what you did. Love the pun! Thanks for the tutorial too. Love the lids inside the glass jar!! What a great way to display them. Love it! I saw the same tutorial and wondered if I could actually do it.....you've inspired me to try it! Love the jar of lids! I will have to try this idea. Sounds simple enough. Thanks for sharing!